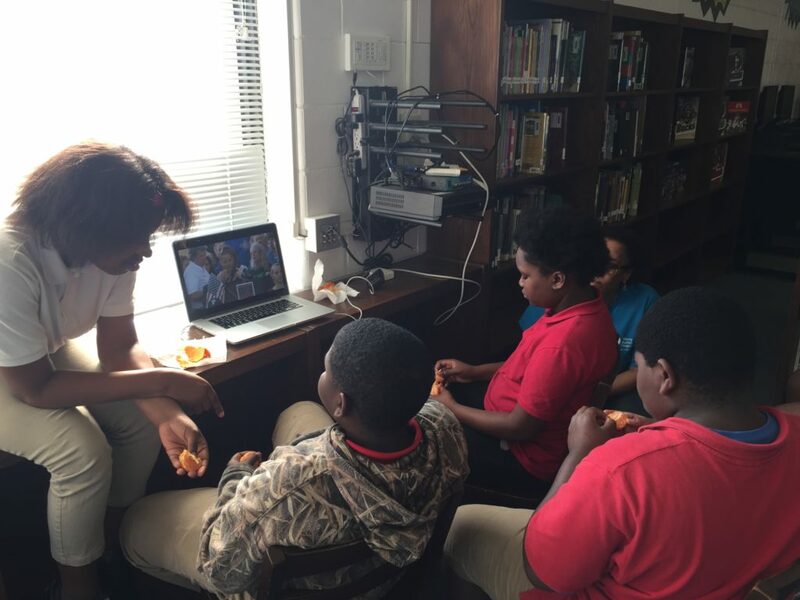 In spring 2018, Deep Center, thanks to an Educator Innovator mini-grant from the National Writing Project, piloted extended programming at one of Savannah’s most challenged public schools, Hubert Middle School. 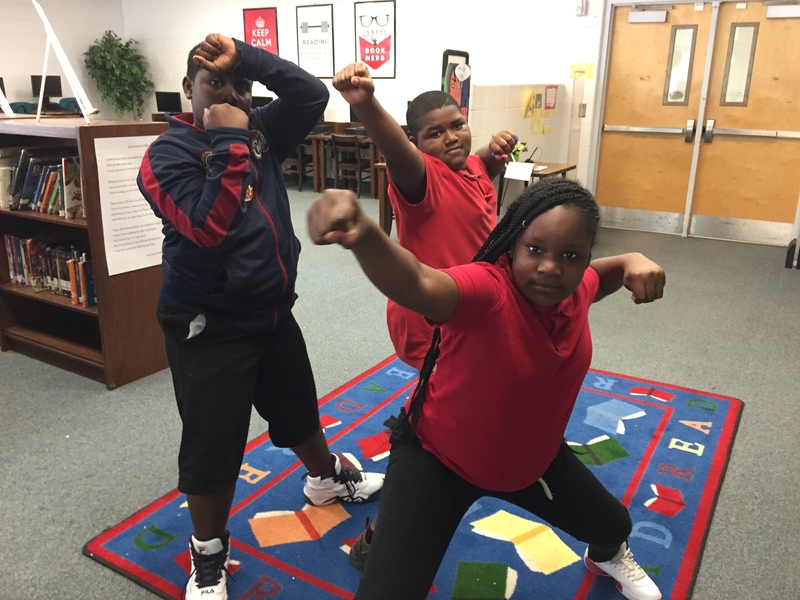 Deep Center’s mission is to empower Savannah’s young people to thrive as learners, community leaders, and agents of change. Through creative writing, cultural production, and art, Deep creates platforms for the city’s youth and the village of support around them, including their families and adult allies, to share stories, engage in debates, and make Savannah a more just and equitable place. 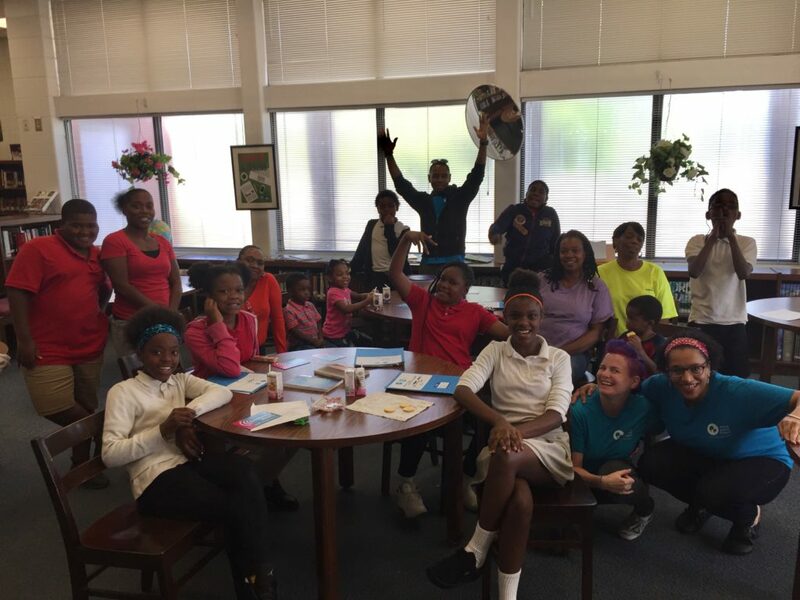 In our workshop at Hubert, Deep Center used assets-based creative-writing, connected learning, multimodal exploration, and intergenerational community engagement to help young people connect their learning to their lives and their lives to their community. Deep and Hubert built from an existing partnership to expand and tailor programming to the school’s and neighborhood’s unique challenges and context. This expansion included a doubling of programming hours (meeting twice weekly for 11 weeks), replacing volunteer teaching artists with paid teaching artists, and more intentional engagement with the community around critical issues facing the surrounding neighborhoods that the youths called home. Final products were inclusion in a published book and a final performance. Immediately upon beginning the program, we realized our group of sixth graders needed a different program than the one we’d originally planned. Because of Deep’s grounding in a strong pedagogy and program plan, we were able to adapt our plan as our young people needed while remaining true to our pedagogical framework. Nearly all of the young people exhibited behavior indicative of a trauma response, so we adapted our program to fit what they showed us they needed. Deep is, first and foremost, a creative writing program. But at first, writing could occur only haphazardly. Youth wrote when prompted but lost focus quickly and often. Many youth needed to move and were unable to sit still, a typical symptom of hyperarousal. Some were the opposite—shut down and hard to engage. Others struggled to keep the space respectful and inclusive for all. A few were clearly seeking attention and affirmation, a few were emotionally volatile. Our boys especially got physically violent with one another and traded insults like jokes. Then the Parkland, FL mass shooting happened, and the next day, a student attempted to bring a gun to Hubert. The school went on lockdown for the entire day. No one was harmed, and school resumed the following day, the day of our writing workshop. Deep’s teaching artists, Erin DeYoung, Desina Van, and Phil Davis, responded with a lesson plan to help young writers process and respond creatively and thoughtfully to the event. And because of the intensity of this learning moment, I was present to help facilitate. We started with a free write: Write about what happened yesterday. We asked: How did it make you feel? Did you know what was going on? How do you imagine the teachers felt? One sixth grader, Daniel, said he didn’t feel anything. It wasn’t a big deal. His classmate, Andre, said he just felt bored, stuck in the same classroom all day. In Deep, all feelings are valid. But in Deep, we aim to get to the root of problems, so we kept asking questions. 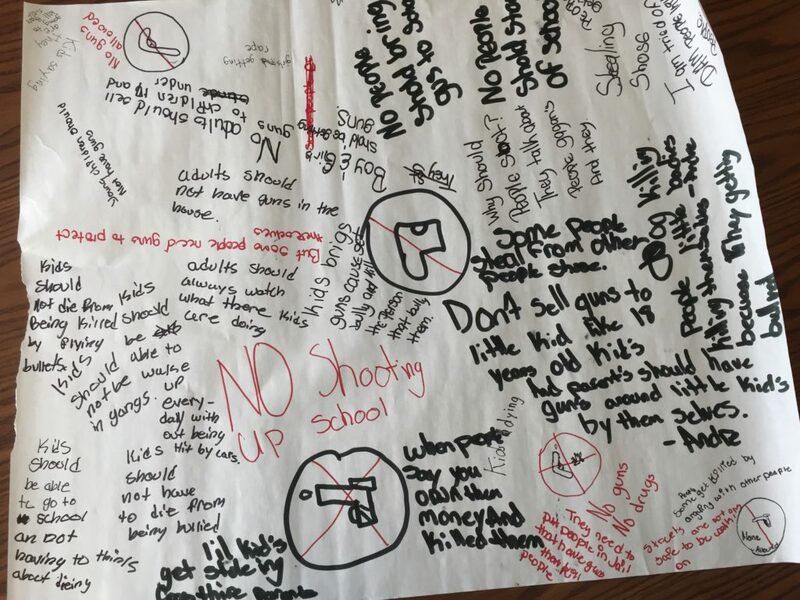 Armed with Sharpies and chart paper, the youth started listing out the problems they noticed in their communities. Pictures of handguns were drawn, with big, red Xs through them. “No guns to anyone under 18,” one youth wrote. “Anyone who shoots more than ten people should go to jail,” wrote another. Daniel meant what he said. Ten was the limit. Ten was too many. “Why might someone feel like they need to have a gun?” I asked. “To protect your house,” they answered. I realized our group had a lot of learning, and unlearning, to do. Learning about how handguns are responsible for far more deaths than assault rifles, one death at a time. How the communities our youth live in, communities that are last in line to receive resources and opportunities, are disproportionately affected by gun violence. How one life lost in a neighborhood is one too many, and how it matters that this feels boring and normal. How we don’t have to live like this; how the world is bigger than these streets; how there are young people pushing for policy change and reform; how our youth could add their voices to the battle cry. I saw glimmers of this, the wisps of a beginning, when we challenged the youth to think more broadly and examine problems beyond gun violence. What other problems exist in your lives? What’s happening at the same time? Zanayah noted sexual assault, with special regard to female victims. Raven told a story about her uncle, who was “not all there in the head”, being struck by a tow truck while walking to work, without safe sidewalks to walk on. J’Sean revealed his cousin had once brought a gun to high school and was sent to the youth detention center, but he was out now. Then we watched a recording of gun reform activist and youth leader, Emma Gonzalez, giving her speech days after 17 of her high school peers were murdered. Our group had the usual preoccupation with peeling clementines and jostling for the best seat in the beginning, but as Emma got on a roll, our young people leaned in. Here was someone not much older than them, demanding change. She was forceful. She was a powerful speaker. I wondered, though, if they saw themselves in her. Her skin was a different color. She lived elsewhere. She was a senior in high school; they were sixth graders. Eleven-year-olds. There were few, if any, people of color on the screen. Sensitive Raven looked at the teaching artists over her shoulder, and whispered to her neighbor, asking if Erin was crying. “Ms Erin, are you okay? Why are you crying?” they asked. “My babies were too close to gun violence this week,” she answered. “You got kids?” they asked. “No, I mean you. You’re all my babies,” she replied. A few faces registered surprise, then validation–affirmation that they were important, that this adult cared. We talked about how Emma was speaking out. About how we wanted to hear what they thought, too. How we were going to focus on the gun violence plaguing their school and neighborhoods and create art together to make their voices powerful like Emma’s. Imagine, we said, that anything is possible—advanced technology, magic, superheroes. What could we do to solve the problem of gun violence? It became clear that sitting down and writing prose wasn’t working. We spent all our energy trying to control their bodies, not channeling their energy into creation. Youth were worked up, couldn’t settle in, kept picking at each other. Since they liked the physicality of writing on chart paper together, we switched to composing through visual art. On big sheets of paper that allowed a lot of freedom of movement, each youth drew a superhero character of their own design and answered a series of questions to develop the character’s identity. Many of these characters turned out to be autobiographical—a mashup of fantasy, hope, and self. In the following weeks, we experimented with improv and ad lib script writing. After we introduced a scenario of a youth bringing a gun to Hubert, we asked the youth to respond to the situation using their superheroes. They were allowed to act out the scene together, to play. And all of a sudden, we adults weren’t trying to police their bodies. When they embodied their superheroes, they acted with purpose. They began to self-regulate. There was running and jumping and superhero somersaults underneath desks. There were freeze-rays and gun-melting fires. There was solidarity between the superhero team as they worked toward a common goal of stopping the alleged shooter. At first, our superhero team resorted to the same punitive narratives they heard in school and on TV. The villain was thrown in jail for life, no questions asked. Raven even used the confidence she’d newly found in her super alter ego to bully the villain, playing the “bad cop” and listening to nothing but her own bravado. We let that scene play out and recorded the audio. We listened to the playback together and laughed a lot, but then I pushed. There was a general grumbling of dissent. I pushed. Ultimately, the young people agreed that responding to a hurt with more hurt doesn’t fix the situation. So we called “action” and watched them work through an alternative solution. When the villain admitted to feeling coerced by a gang, the superheroes first ensured his physical safety, then began to visually examine him. One young hero found a power switch on the gunman’s wrist and realized he was part robot, programmed by the gang. “I know what we can do!” exclaimed Raven. “We can give him some of our superhero goodness to replace that gang part of his brain.” They performed a selective lobotomy on the gunman-cyborg and added their strength to his. The gang-programmed part of his brain was gone, and he felt better, relieved, healed. On our final day together, youth invited family members into the space to celebrate their hard work. As cousins, moms, siblings, aunties, and grandmothers looked on, the heroes of Hubert created a new reality. The applause was thunderous as the authors took a final bow together. The challenges this teachable moment presented at Hubert forced Deep Center to become yet more intentional about creating spaces across our programs to help youth—especially youth who’ve experienced trauma—to respond to such instances of violence and injustice thoughtfully, creatively, powerfully, and with the potential to heal. The organizational learning around Hubert rippled throughout all of our programs. I wrote and published this blog post on the site for our Young Author Project curriculum, which acts as the foundational curriculum and pedagogy for all our programs.